BOSTON, MA--(Marketwired - Mar 19, 2014) - Kinvey (www.kinvey.com), the leading enterprise Mobile Backend as a Service (MBaaS) platform, has published an infographic to visualize how enterprise mobility is disrupting the IT landscape. The infographic not only maps the acquisitions and partnerships among "traditional" IT and cloud players as they catch up to the new demands of enterprise mobility, but also showcases the rise of mobile-first companies that are building innovative cloud-based mobile stacks and backend services. 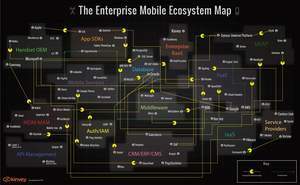 The Evolving Enterprise Mobility Ecosystem Map can be viewed here. According to Kinvey CEO, Sravish Sridhar: "Today, enterprise mobility may look like a peripheral part of the IT infrastructure, but the reality is that mobile is rapidly becoming the primary access point to apps and data for many businesses. IT infrastructures are going to have to become very mobile friendly -- very quickly -- or else risk becoming a legacy platform." The accelerating drive for mobility in the enterprise means that IT departments are looking to standardize their mobile stacks. Kinvey's infographic illustrates how large IT, IaaS, and PaaS vendors are scrambling to piece together end-to-end enterprise mobility solutions through strategic acquisitions and partnerships -- such as Intel's acquisition of Mashery and VMware's acquisition of AirWatch. Enterprise IT departments require a secure, standardized platform to connect mobile apps to data, authentication services, and other APIs. Lines of business need the flexibility to build and launch B2E, B2B, and B2C apps working with internal or external development teams, while at the same time being assured of seamless connections to existing systems of record. Kinvey is the leading enterprise Mobile Backend as a Service (MBaaS) platform. The company makes it easy for developers to setup and maintain a store-ready or enterprise cloud backend for their mobile, tablet, and web apps. The company offers MBaaS platforms and solutions for individual developers, enterprise developers, and agency partners. Pre-built features include location services, social integration (including Facebook Open Graph), push notifications, and custom code. Enterprise features include integration with cloud and on-prem data sources and authentication systems. Kinvey is a Techstars Boston 2011 alum and is based in Boston, MA. For more information, visit http://www.kinvey.com.